If you’re looking for a clear trash bag that can handle really tough piles of trash, this is it. These extra heavy clear garbage bags are a full 2 mil thick: strong enough to carry loads of over 100 lbs. 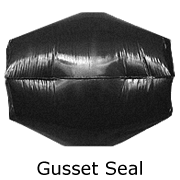 The low-density plastic used in these bags is exceptionally resilient, offering great flexibility and a high degree of puncture resistance. Whether you’re using these bags outside, in the kitchen, or in a warehouse, they’ll hold their own against sharp edges and pointy refuse. Offering a full 55 to 60 gallon capacity, they are a good size for extra large commercial cans. These bags are proudly American-made.If you’re looking for a clear trash bag that can handle really tough piles of trash, this is it. These extra heavy clear garbage bags are a full 2 mil thick: strong enough to carry loads of over 100 lbs. The low-density plastic used in these bags is exceptionally resilient, offering great flexibility and a high degree of puncture resistance. Whether you’re using these bags outside, in the kitchen, or in a warehouse, they’ll hold their own against sharp edges and pointy refuse. Offering a full 55 to 60 gallon capacity, they are a good size for extra large commercial cans. These bags are proudly American-made. This is a great product...super durable liners. And BIG! I'll definitely be buying these again when we run out. These 2 mil thick bags which I use for green waste curb disposal are more superior than any other trash bag. They get holes poked in them from twigs and trimmings and still hold up for the trashmen tossing them on the truck. High quality, exactly as described. Arrived three days later and free shipping. Perfect! Sturdy! Well worth every penny!